RenegadeMonster wrote: You would actually be surprised. As far as ridership I haven't noticed a drop off on the Eastern. At least on the trains I take. Been on the 7:23 Express out of Salem every morning so far this week and we have been 6 and 7 car sets. And we are filling the to where there are 2 people in each seat. Only the 6 car sets saw people squeezing in middle seats. It's odd seeing Salem Station have as many people board as you see at North Station get on the train for the Commute Home. I'm not saying you don't still need the same size sets (# of cars per train), just don't need as many train sets to serve the Eastern Route right now. Those surplus trainsets could be broken down right now to lengthen the remaining sets on the North side. Is it better for the equipment (coaches) to be kept moving & powered, instead of just sitting idle? That might be a reason for the long consists, instead of just parking the unneeded coaches until the drawbridge work is done. Ah, that makes sense. Thank You. 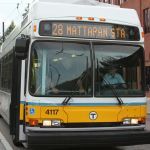 Under the old schedule, 8 sets are needed for the Eastern Route in the morning peak (counting the number of trains that are running or turning in Beverly between 8am and 8:15). Under the current schedule, I count 6 sets being needed. So with 2 sets no longer needed, that means 10 cars (going from the usual 5 cars per set) are freed up, which is enough to give each of the remaining Salem trains an extra car and even potentially to have most of them be 7 car sets. 421 last Friday was a 7 car set with two Rotems. However, the train was a crewmember short so it was being treated as a 5 car set. Is it up to the head conductor if they want to open up the whole train or block of cars if they are short staffed? I have seen them operate with 2 conductors with all the card open on a 6 & 7 car set before. Actually more often then them blocking off a car during rush hour. Also, I have seen a 5 car set where the conductor was all by him self. He kept making announcements to remind us of that and to please exit at the front of the train. Was on a 7 car set tonight operating as if it were 6. First car behind the engine was closed off. Here is the kicker though. We had a lone conductor. Passenger Count train has a 16XX control cab today. RenegadeMonster wrote: Is it up to the head conductor if they want to open up the whole train or block of cars if they are short staffed? Crew of one. Head car or more as the Conductor feels they need and can safely operate. Crew of two. Six car open. Crew of three. All cars. This is only at rush hour. Off peak the two cars against the loco open, and in practice just one of the two back there(normally just the double decker). If there is only one conductor where do they usually reside? Usually they are between the first two cars. But tonight on a 4 car set the lone conductor was between car 2 and 3 which was especially awkward because car 1 and 2 were double deckers and the mini high platforms were being hit between cars 2 and 3. There is a 4-car set on the North Side with three control coaches in it. Three! Out of four! The 1632 is on the rear. Pretty sure I have seen 3 or 4 1600 series on a 7 car set recently. Only, pretty sure a few of them had their controls deactivated. Also, recently I saw a set with 4 300 series. Is it just me, or do you not normally see to many 300s on the North Side. Also, did any 1300s ever exist? get numbers, and it was gone before I realized it wasn't stopping. I checked the schedule and it was running between trains. I'm guessing it was an equipment move. 406 died and 408 had to tie on. There were more than 3 cars on each set.